228 pages | 96 B/W Illus. Historically, many architects, planners, and urban designers solicit idealistic depictions of a controllable urban environment made from highly regulated geometrical organizations and systematically defined processes. Rather than working as urban "designers" who set out to control and implant external processes, we shift our approach to that of urban "detectives," who set out to chase the city. Charged with approaching the city more responsively, we investigate what we do not know, allowing the city to direct our work. As urban detectives, we have the ability to interrogate and respond to the elaborate patterns emerging from self-generated, internalized urban interactions. Chasing the City asks what are the current design trends shaping how we, first, understand the cities of today to, then, produce informed decisions on the continuously undefined evolving city of tomorrow. Intentionally, the work here does not adhere to rudimentary notions of supposed singularities or rely upon past generations of idealistic utopian models. 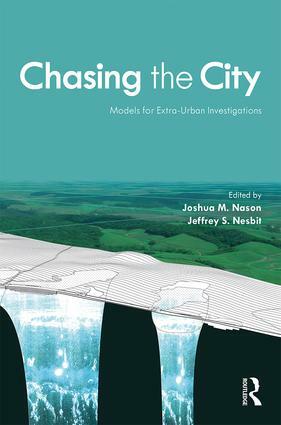 Rather, Chasing the City delineates current models of urban investigation that seek to respond to the nature of cities and develop heretofore-urban strategies as concurrently negotiated future urbanism. This edited volume provides a collection of innovative design research projects based on shared notions of Chasing the City through three bodies of strategic frameworks: (1) Mapping, (2) Resource, and (3) Typology. This structure ultimately allows readers, as fellow urban detectives, access to exploratory tools and methods of detection that accumulate from our environs, both practical and projective in our chase of the city. Joshua M. Nason, educated at Cornell and Texas Tech, is an Associate Professor of Architecture at the University of Texas at Arlington as well as the director of the experimental design research firm Iterative Studio. His teaching, research, and design work explore dynamic and dependent contextual relationships and issues of city identity through analytic mapping processes. Jeffrey S. Nesbit, a doctoral candidate at Harvard University’s Graduate School of Design, studies sporadic development, dismantled landscapes, and the evolution of military infrastructure in the 20th century. He is founding director of Haecceitas Studio, a design-research group, director of Seoul Studio, a research program in South Korea, and has taught architecture and urban design at the University of North Carolina Charlotte and Texas Tech University.